Fire retardant tarps offered by Tarpcoversales.com are certified under the California State Fire Marshal. Our fire retardant fabrics go through a strict two part testing process with first an independent testing agency and finally with the California State Fire Marshal's Office. Offered in either silver or white, each tarp comes with the California State Fire Marshal tag permanently attached to the side of the tarp. Our Fire Retardant tarps are weather resistant- 100% UV Protection, Waterproof, and Mildew-proof. Its strong, tear resistant high density polyethylene. 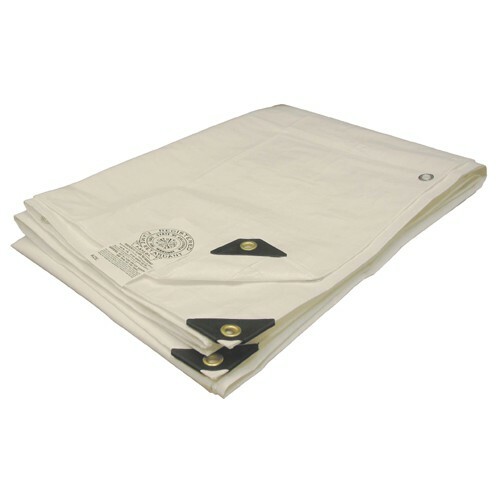 Each tarp comes with heavy-duty rust resistant grommets every 18 inches with rope reinforced corners and eyelets. Tarpcoversales.com is your choice of Fire Retardant Tarps for better quality and better price.